Original Antique Maps and Prints. Description: This original antique print was published in The Netherlands ca. Artists and Engravers: This plate engraved by R. Subject: Plate :'De aankomst des keizers van China bij zijne tent in Tartarijen, om den Britschen ambassadeur te ontfangen. 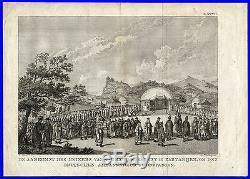 (The arrival of the Chinese Emperor at his tent in Tartary where he receives the British ambassador). Corners of the margins somewhat wrinkled. Size (in cm): The overall size is ca. 29.5 x 21 cm. The image size is ca. 24 x 16.5 cm. Size (in inch): The overall size is ca. 11.6 x 8.3 inch. 9.4 x 6.5 inch. Medium: Copperplate engraving on a verge type of hand-laid paper. ThePrintsCollector - Laurentius Old Master Prints Frans Laurentius, Peter Cornelissen Margo van Latum-van Dongen, Frank van Latum Located in Zeeland (Noord-Brabant) - The Netherlands. GO TO OUR STORE and explore our huge collection of fine antique maps and prints. The item "Antique Print-CHINA-EMPEROR-TARTARY-BRITISH AMBASSADOR-Vinkeles-Alexander-1780" is in sale since Wednesday, March 18, 2015. This item is in the category "Art\Art Prints". The seller is "theprintscollector" and is located in Zeeland. This item can be shipped worldwide.